Hamstring injuries are common problems that may result in significant loss of on-field time for many athletes because these injuries tend to heal slowly. Once injury occurs, the patient is at high risk for recurrence without proper rest and rehabilitation. The hamstring muscles are 3 muscles in the posterior thigh: the semitendinosus, semimembranosus, and biceps femoris. The semitendinosus originates at the ischial tuberosity and inserts at the pes anserine; the semimembranosus originates at the ischial tuberosity and inserts at the posterior medial tibia. The biceps femoris has a long head that originates at the ischial tuberosity and a short head at the posterolateral femur and inserts into the head of the fibula. These muscles serve as knee flexors and hip extensors. See the image below. Normal sagittal alignment permits the knee to lock in full extension, aided by powerful quadriceps and an intact extensor mechanism. 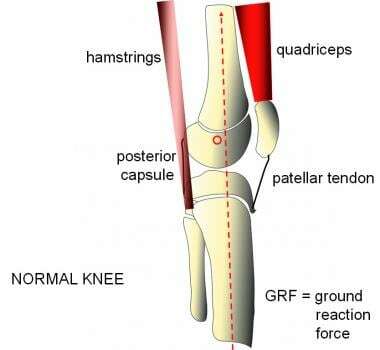 The ground reaction force passes anterior to the "center of rotation" of the knee, while the posterior cruciate ligament, posterior capsule, hamstrings, and gastrocnemius provide a tension band effect. While hamstring injuries can occur in people of any age, incidence increases with age. Schache AG, Wrigley TV, Baker R, et al. Biomechanical response to hamstring muscle strain injury. Gait Posture. 2009 Feb. 29(2):332-8. [Medline]. Yu B, Queen RM, Abbey AN, et al. Hamstring muscle kinematics and activation during overground sprinting. J Biomech. 2008 Nov 14. 41(15):3121-6. [Medline]. Silder A, Heiderscheit BC, Thelen DG, et al. MR observations of long-term musculotendon remodeling following a hamstring strain injury. Skeletal Radiol. 2008 Dec. 37(12):1101-9. [Medline]. Tokutake G, Kuramochi R, Murata Y, Enoki S, Koto Y, Shimizu T. The Risk Factors of Hamstring Strain Injury Induced by High-Speed Running. J Sports Sci Med. 2018 Dec. 17 (4):650-5. [Medline]. [Full Text]. Silder A, Thelen DG, Heiderscheit BC. Effects of prior hamstring strain injury on strength, flexibility, and running mechanics. Clin Biomech (Bristol, Avon). 2010 Aug. 25(7):681-6. [Medline]. [Full Text]. Heiderscheit BC, Sherry MA, Silder A, Chumanov ES, Thelen DG. Hamstring strain injuries: recommendations for diagnosis, rehabilitation, and injury prevention. J Orthop Sports Phys Ther. 2010 Feb. 40(2):67-81. [Medline]. [Full Text]. Goldman EF, Jones DE. Interventions for preventing hamstring injuries: a systematic review. Physiotherapy. 2011 Jun. 97(2):91-9. [Medline]. Fousekis K, Tsepis E, Poulmedis P, Athanasopoulos S, Vagenas G. Intrinsic risk factors of non-contact quadriceps and hamstring strains in soccer: a prospective study of 100 professional players. Br J Sports Med. 2011 Jul. 45(9):709-14. [Medline]. Green B, Bourne MN, Pizzari T. Isokinetic strength assessment offers limited predictive validity for detecting risk of future hamstring strain in sport: a systematic review and meta-analysis. Br J Sports Med. 2018 Mar. 52 (5):329-36. [Medline]. Erickson LN, Sherry MA. Rehabilitation and return to sport after hamstring strain injury. J Sport Health Sci. 2017 Sep. 6 (3):262-70. [Medline]. [Full Text]. Schmitt B, Tim T, McHugh M. Hamstring injury rehabilitation and prevention of reinjury using lengthened state eccentric training: a new concept. Int J Sports Phys Ther. 2012 Jun. 7(3):333-41. [Medline]. [Full Text]. Alonso JM, Edouard P, Fischetto G, Adams B, Depiesse F, Mountjoy M. Determination of future prevention strategies in elite track and field: analysis of Daegu 2011 IAAF Championships injuries and illnesses surveillance. Br J Sports Med. 2012 Jun. 46(7):505-14. [Medline]. [Full Text]. Maniar N, Shield AJ, Williams MD, Timmins RG, Opar DA. Hamstring strength and flexibility after hamstring strain injury: a systematic review and meta-analysis. Br J Sports Med. 2016 Aug. 50 (15):909-20. [Medline]. Warren P, Gabbe BJ, Schneider-Kolsky M, et al. Clinical predictors of time to return to competition and of recurrence following hamstring strain in elite Australian footballers. Br J Sports Med. 2008 Aug 14. [Medline]. Guillodo Y, Here-Dorignac C, Thoribe B, et al. Clinical predictors of time to return to competition following hamstring injuries. Muscles Ligaments Tendons J. 2014 Jul. 4(3):386-90. [Medline]. [Full Text]. Silder A, Sherry MA, Sanfilippo J, et al. Clinical and morphological changes following 2 rehabilitation programs for acute hamstring strain injuries: a randomized clinical trial. J Orthop Sports Phys Ther. 2013 May. 43(5):284-99. [Medline]. [Full Text]. Tyler TF, Schmitt BM, Nicholas SJ, McHugh MP. Rehabilitation After Hamstring-Strain Injury Emphasizing Eccentric Strengthening at Long Muscle Lengths: Results of Long-Term Follow-Up. J Sport Rehabil. 2017 Apr. 26 (2):131-40. [Medline]. Sallay PI, Ballard G, Hamersly S, et al. Subjective and functional outcomes following surgical repair of complete ruptures of the proximal hamstring complex. Orthopedics. 2008 Nov. 31(11):[Medline]. Barbosa GM, Trajano GS, Dantas GAF, Silva BR, Vieira WHB. Chronic Effects of Static and Dynamic Stretching on Hamstrings Eccentric Strength and Functional Performance: A Randomized Controlled Trial. J Strength Cond Res. 2019 Feb 14. [Medline].